A young infant Zaraki Kenpachi found in the 79th District of Rukongai’s North Alley, “Kusajishi”, Yachiru is a cheerful, carefree girl who often clings to Kenpachi’s back for transport. She is child-like in both appearance and action, but is also very strong, earning the right to be the lieutenant of the 11th Division. Her name is said to be in memory of the only person Kenpachi ever admired. Cute cosplay! She’s so adorable, just like Yachiru. I sometimes wonder which one is cuter, her or Nell? Anyway, great cosplaying! I know what you’re thinking, and no, I’m not kidding. You have to admit, this is a pretty accurate cosplay of Sesshoumaru. Maybe he looks a bit friendlier than the real Sesshoumaru, but hey, he had to be trained somehow. It makes me wish Rin was around to see this. Thanks to Godly for sharing this photo! When Sakura had a vision of a mysterious symbol Syaoran found in the ruins, she visits Syaoran the following day, unknowingly sealing her fate. The symbol in her visions pull her into a secret room, turning her soul into a pair of ghostly wings. Syaoran was able to rescue her at the cost of her wings and soon finds out from High Priest Yukito that they had to find a way to retrieve the feathers scattered through dimensions or Sakura will die. Beautiful cosplay! I especially like the feather Sakura is holding. I wonder if she made it from scratch or cut and painted a real feather? Nice job though! Graduating from the Soul Society’s Academy after only a year, Ichimaru Gin became captain of the 3rd Division after serving under Sosuke Aizen as the lieutenant of the 5th Division. He joins Aizen when he escapes to Hueco Mundo in order to fulfill Aizen’s plans to “change the world”. The only person he seems to truly care about is Mtsumoto Rangiku, a childhood friend and lieutenant of the 10th Division under Hitsugaya Toshiro. I have no idea why he’s carrying Gin’s portrait. Maybe to show that the old Gin as a captain is dead and a new Gin, labeled a traitor, is born? It’s scary at how similar they look though. Nice cosplaying! Urameshi Yusuke’s rival who became his loyal friend and companion as time passed by, Kuwabara was thought of as a normal human being with strong Reiki (spiritual) sensitivity. He was able to master his powers, manifesting a Rei Ken or “spirit sword” and by the end of the series, becomes the strongest human alive. I didn’t like Kuwabara that much when the series came out. He’s a main character, but he was mostly there for comic relief. It was nice that he thought about his future in the final chapters though. Great cosplay! A character that only appeared in the manga, Sailor Cosmos is said to be the ultimate form of Sailor Moon. She comes from the future as an infant named “Chibi-Chibi” to encourage Usagi to defeat Chaos in the final battle. She initially wanted to destroy the Galaxy Cauldron altogether, but Sailor Moon protests when she realized no stars will be born if the Cauldron is destroyed. Sailor Moon’s sacrifice reminded her of the strength and courage she needed, returning to the future with renewed hope. Beautiful cosplay! I always thought she was far more beautiful than Sailor Moon. Then again, she and Sailor Moon may be one and the same. What do you guys think? 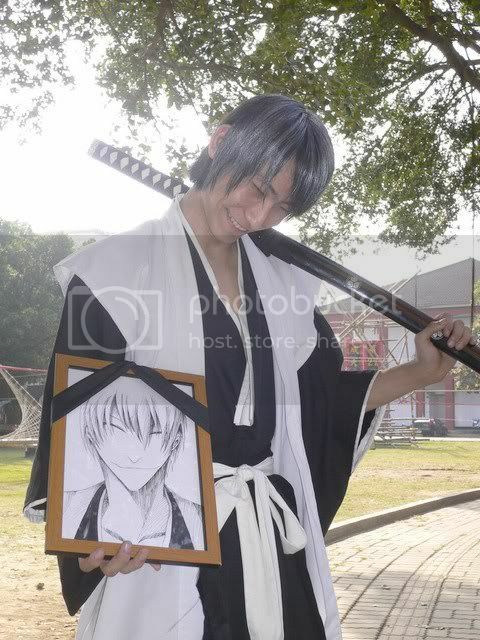 You are currently browsing the Nanao’s Cosplay Research weblog archives for September, 2009.